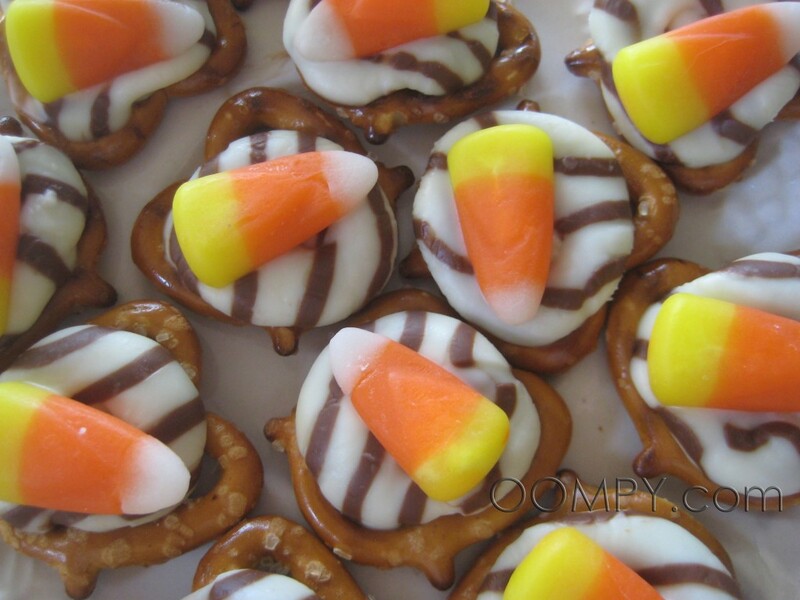 5 Of Our Favorite Halloween Treats! Halloween is less than two weeks away and we are getting pretty excited! Today we wanted to share 5 of our favorite DIY Halloween Treats from around the web. Enjoy and get crafty! 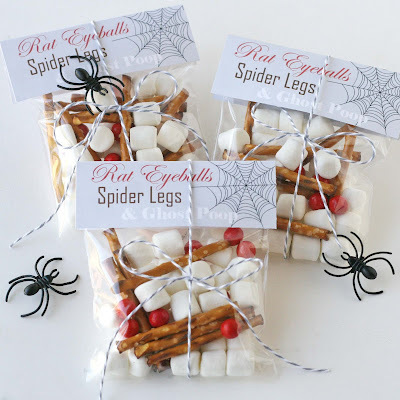 Rat Eyeballs, Spider Legs, & Ghost Poop Treat Bags – This adorable (and hilarious) tutorial comes from Glory of Glorious Treats. She even includes free printables! Yay! Vampire Bites – These adorable snacks come from OOMPY! Such a simple recipe with beautiful results! 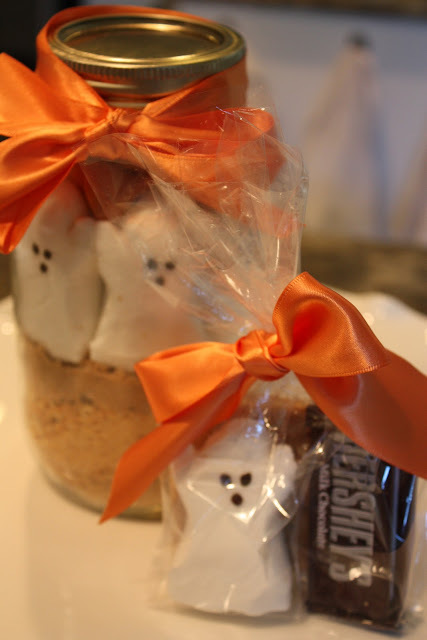 Halloween Peeps In A Jar – Yummy marshmallows, graham crackers, M&M’s make a delicious Halloween S’more Bar! This cute and simple tutorial comes from Southern Vogue! These would make great party favors! Trix-or-Treat Goodie Bags – Super simple and super tasty. This tutorial comes from Stephanie of Somewhat Simple, includes FREE printables, and would make a great favor as well! Halloween Push-Up Pop Parfaits – These are seriously too cute. This great tutorial was created by Erin of Procrastination Station. Check it out! What is your favorite part of Halloween? We love getting dressed up! Today we’ve got a recipe for healthy and delicious homemade hummus that will give you lots of options to customize based on your families topping preference. It makes a great snack to enjoy during a party, football game, or even just at lunch time. So forget about the store-bought stuff and give this homemade version a try! In a blender combine all the ingredients and blend until creamy or smooth. You can add any of the variations to the blender or top the basic hummus recipe with one or all of them depending on what flavor you are looking for. 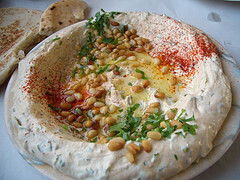 Place the hummus in a bowl or glass container with a lid (if you intend to store it). Garnish the hummus with pepper, pine nuts, and a drizzle of olive oil. Serve with veggies, pita, pretzels, tortilla chips, or use a sandwich spread. How do you like your hummus: garlicy, spicy, or plain? With Gravenstein apples just coming into season we felt inspired to share a recipe featuring the delicious California apple! 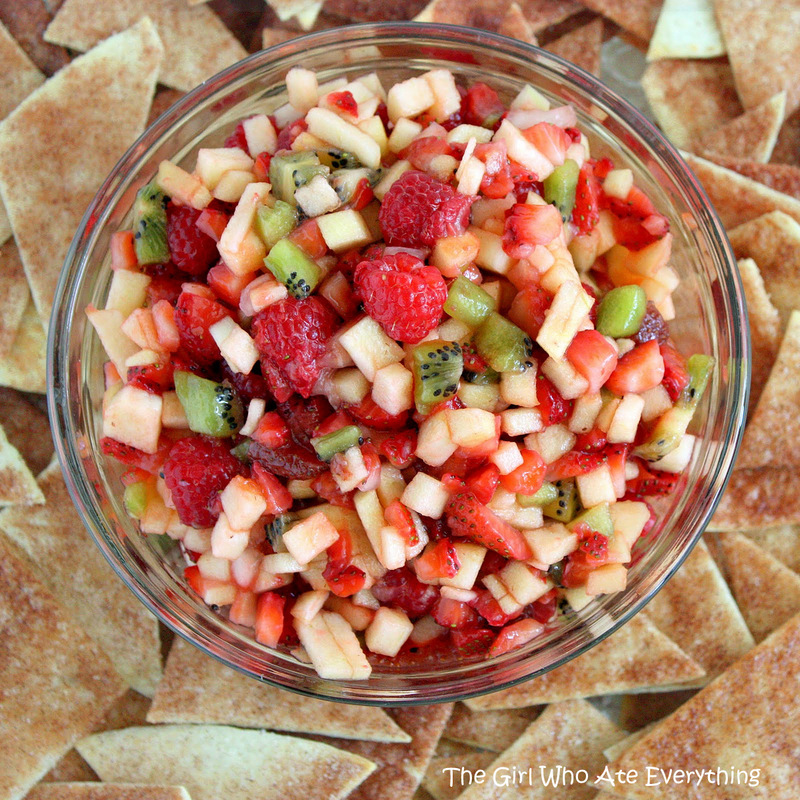 This would make a great appetizer for a party or even just a healthy snack to share with little ones. (Picture from The Girl Who Ate Everything). 3 tbsp. fruit preserves, any flavor you like! We love orange marmalade in this one. Mix the kiwis, Gravenstein apples, raspberries, blueberries, strawberries, brown sugar and fruit preserves in a large bowl. Cover and chill in the refrigerator at least 15 minutes. Coat one side of each whole wheat flour tortilla with cooking spray (buttered flavor works nicely). Cut the tortillas into wedges and arrange in a single layer on a large baking sheet. Sprinkle the wedges with desired amount of cinnamon sugar. Spray again with cooking spray. Bake in the preheated oven 8 to 10 minutes. Repeat with any remaining tortilla wedges. Allow to cool approximately 15 minutes. Serve with chilled fruit salsa. Of course you don’t have to use Gravenstein apples, or you could change up any of the fruit really and still get great results. What are your favorite apples! Today we wanted to share an adorable and easy recipe that is sure to please party-goers of all ages. The recipe comes from Whole Foods and manages to pack in a good bit of protein, fruit while leaving your sweet tooth satisfied. We’ve been obsessed with fresh peanut and almond butter lately and have got some ideas for how to customize the ingredients to suit your unique taste buds. Brush the apples slices with lemon juice to keep them from turning brown (if you aren’t eating them right away). 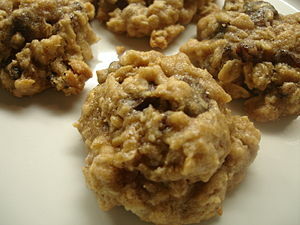 Spread one side of half of the apple slices with peanut or almond butter then sprinkle with chocolate chips and granola. Top with remaining apple slices, pressing down gently to make the sandwiches. What ideas do you have for changing up the ingredients?